Some weeks, it seems like barely a day goes by without learning about some new nefarious activity perpetrated by Wells Fargo, or their repercussions. Case in point, yesterday, Reuters reported that the Office of the Comptroller of the Currency was preparing to sanction the bank for charging customers for auto insurance they didn't really need. The bank has blamed a third party for wrongly layering the insurance policies on its auto borrowers. Wells is investigating auto insurance abuses back to 2005 and estimates it will need to refund $145 million to borrowers, and adjust account balances by another $37 million, according to securities filings. That is up from its initial cost estimate of $80 million. Then on Friday, the Wall Street Journal reported that the Department of Justice is investigating possible abuses in the bank's wealth-management business. The abuses reportedly took place in the Phoenix area, which was also an epicenter of the bank's cross-selling scandal. After whistleblowers reportedly informed the US government that there might be something amiss in Phoenix, regulators instructed Wells to launch an internal probe. As part of the probe, investigators are interviewing employees from the bank's Phoenix Wealth Management office. However, the exact nature of the suspected wrongdoing is unclear. The Justice Department and Securities and Exchange Commission are now probing the bank’s wealth-management business, these people said. Agents from the Federal Bureau of Investigation have been interviewing some wealth- management employees in the Phoenix area as recently as this week, some of these people said. Wells Fargo declined to comment. Officials at the Justice Department and SEC also declined to comment. Several U.S. Attorney’s offices, as well as a bevy of federal and state regulators, have been investigating Wells Fargo since fall 2016 when the bank disclosed widespread sales-practices problems. Those included bank employees opening as many as 3.5 million accounts without customers’ knowledge or authorization. Wells Fargo has said it is cooperating with the investigations. Arizona was one epicenter of Wells Fargo’s retail-banking sales practices problems. Some employees in that region created fake email addresses using customers’ phone numbers to open banking accounts or opened two accounts for each customer, a practice known as a “double pack.” Some top executives from that region have since been terminated by the bank. At some point, the DOJ launched its own investigation, separate from the internal probe. Despite firing executives, including former CEO John Stumpf, and offering to reimburse customers, lawmakers like Senator Elizabeth Warren have criticized the bank and demanded that more changes must be made. During a recent hearing, Warren questioned the bank's decision to send out "opt-in" letters to people affected by its abuses, and accused the bank of not doing enough to make sure customers are fairly compensated. 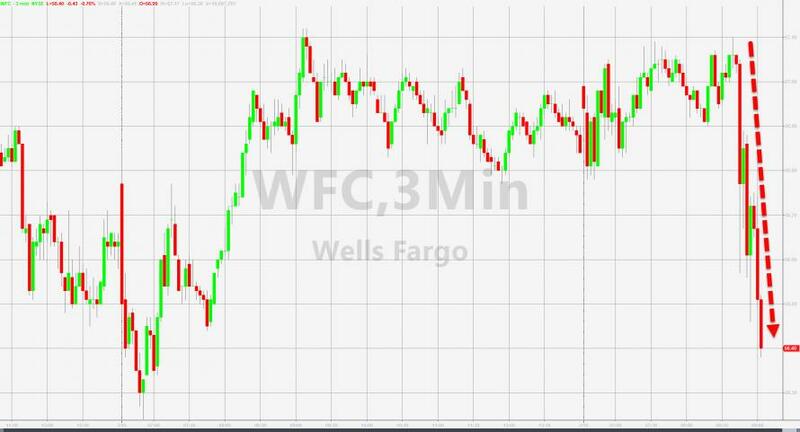 Even though Warren has labeled him "incompetent" and suggested that he should step aside as WFC's CEO, the Wells Fargo's board of directors awarded CEO Tim Sloan a 36% raise. Sloan's total compensation climbed to $17.4 million, compared with almost $13 million in 2016, thanks to increased stock awards, per CNNMoney. The board cited the bank's "solid financial performance," including low credit losses, strong capital and a slight increase in annual profits to $22.2 billion. The board also noted Sloan's "continued leadership" on the "top priority of rebuilding trust and building a better bank." The board believes that paying executives in stock is preferable to cash because it aligns the executive's incentives with the long-term goals of the company. Last month, the Federal Reserve announced what at first seemed like a shocking crackdown by imposing sanctions that would prevent the bank from growing its assets beyond their end-2017 levels. Though analysts were quick to point out that the sanctions lacked teeth. Of course, the big question is What Will Warren Buffett Do (WWWBD)?